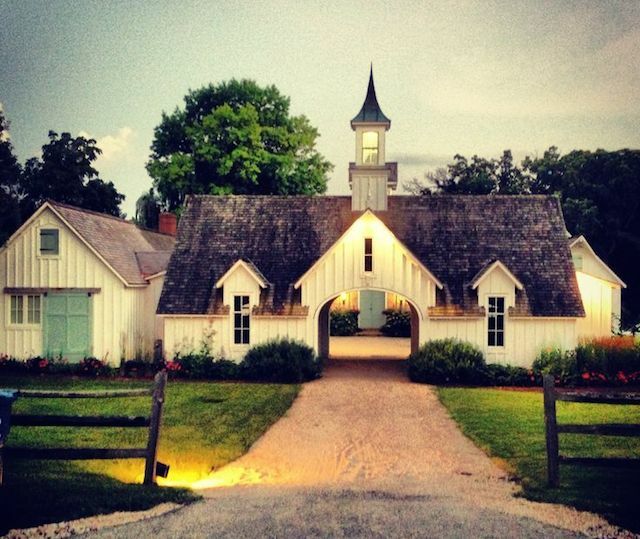 If you know anything about Bynum Design you know that we find farmhouses spellbinding. Farmhouse style tends to wind its way into just about every Nashville space we design and style. 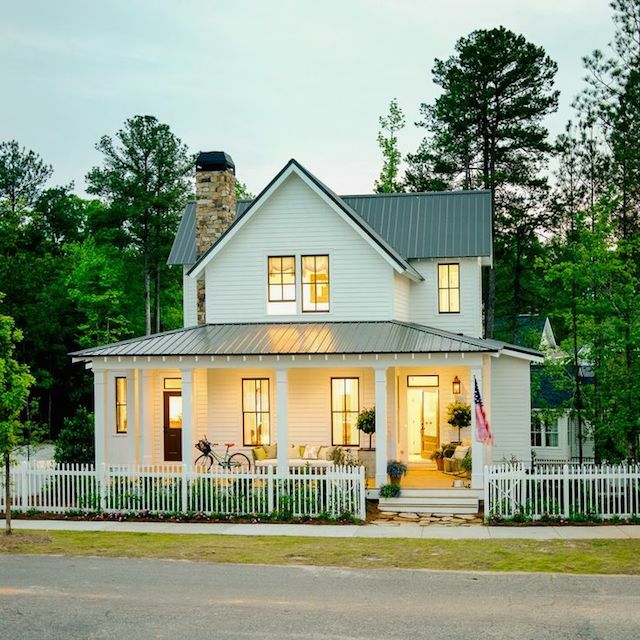 Whether you’re building a house from scratch or are looking to incorporate farmhouse style into your existing home, there are plenty of foolproof ways to give life to the casual, homespun look that makes farmhouses so enchanting. What’s to love about a farmhouse? Farmhouses were built to be durable and to hold a noisy, field-dirty gang of family and friends. They’re unpretentious and soulful. Reinterpreted today, the urban farmhouse represents a simpler time and serves as a retreat from the hectic world right outside the front door. I think that’s why we see so many people romanticizing farmhouses now; a farmhouse represents a desire for an easier way of life. But also–because a farmhouse once served as the dominant structure in a cluster of buildings–it has a naturally commanding presence. Even when they’re simple or minimalist, they’re somehow dramatic. And with their open floorplans people envision them as great, light-filled gathering places for big family meals and happy holidays and parties. 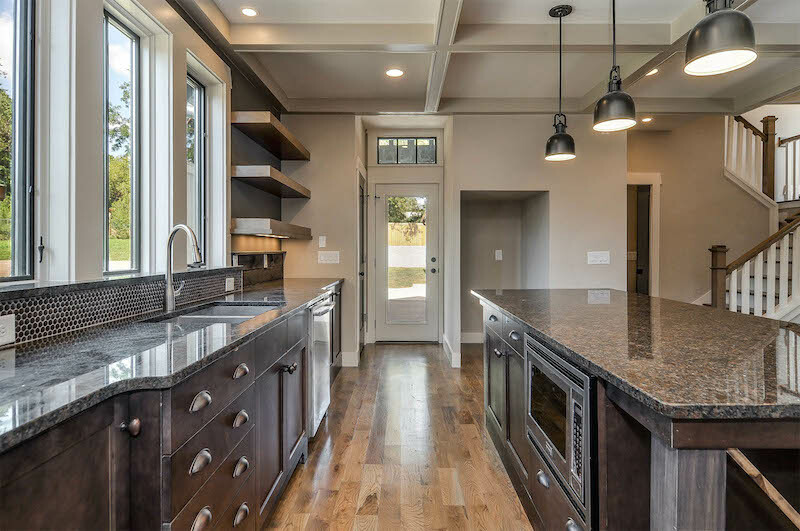 This is true of most homes, but especially in a farmhouse: the kitchen should really be designed to be the heart of the home. What color should the exterior of a farmhouse be painted? Almost everyone wants them to be white, though there a couple on my Pinterest page that are matte black; even unadorned, they are so stately. Other telltale exterior farmhouse elements: It’s best to use casual, straightforward materials like lap siding, shake shingles, and stone. Stick to simple, classic forms and clean Shaker lines–and err toward an exterior that is not overly decorated. We get requests fairly often to do wraparound porches and metal roofs on our farmhouse-inspired structures. 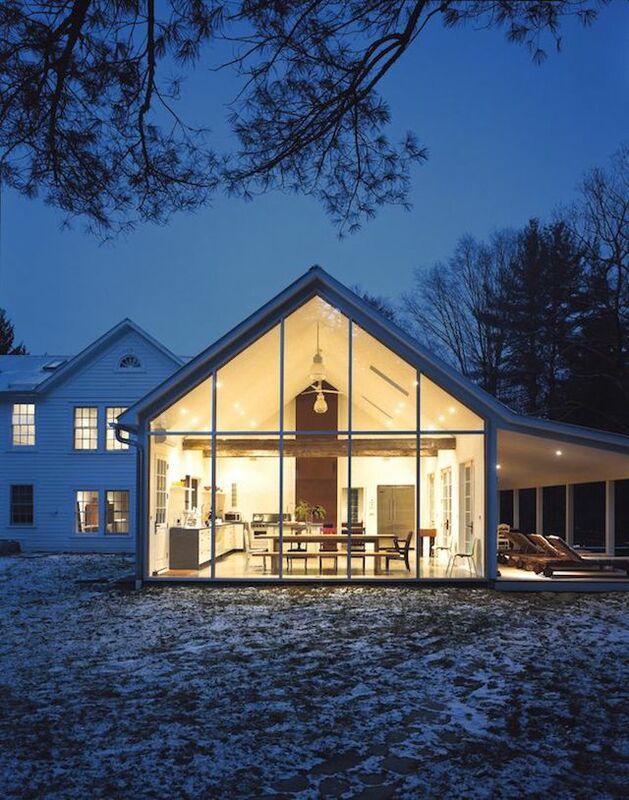 Likewise, metal plays into a farmhouse’s exterior with galvanized metal gutters, downspouts, and barn-inspired light fixtures. Otherwise, I like leaving the rafters of porch ceilings exposed so that you can really see the structure; that’s an honest approach to the materials. Rocking chairs, of course, belong on a farmhouse porch. 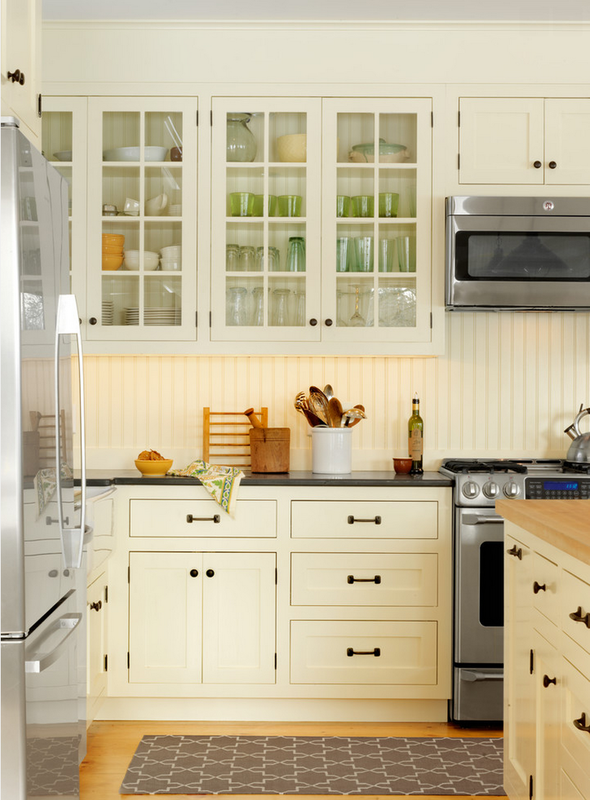 Interior paint colors for a farmhouse: It’s best to keep a farmhouse light and bright. Sometimes we even do multiple shades of white within the same project. It gives it more of that shabby chic look because you’ll see creams and beiges and linens and taupes and whites and grays all in one space. Exterior colors are so much harder to select. For our exteriors we buy quarts of things and put it up in blocks and have a good long look at it before we decide. To date we really haven’t done a lot of different whites on the exterior. We just have a couple that we really like. I’m kind of fond of the idea of doing a dirty white–almost an ivory–for our next farmhouse. 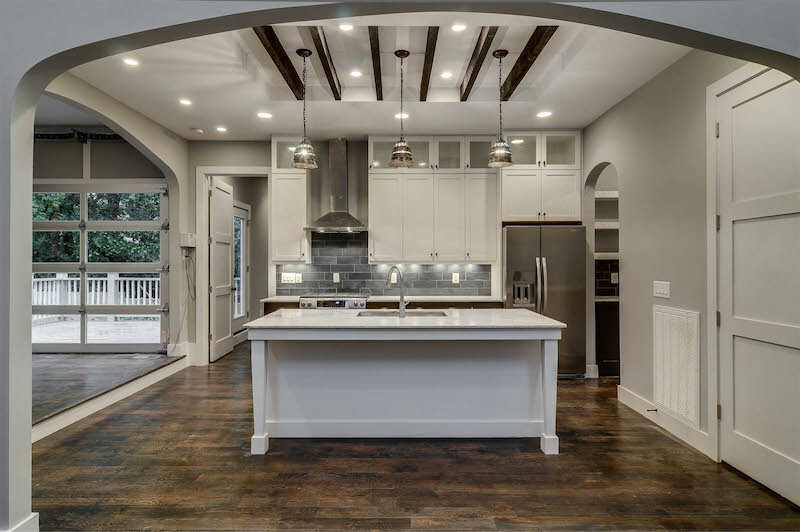 Design and decorative elements befitting a farmhouse: Just like with the porch ceilings, I like leaving interior ceiling beams exposed so you can really see the guts of the place. 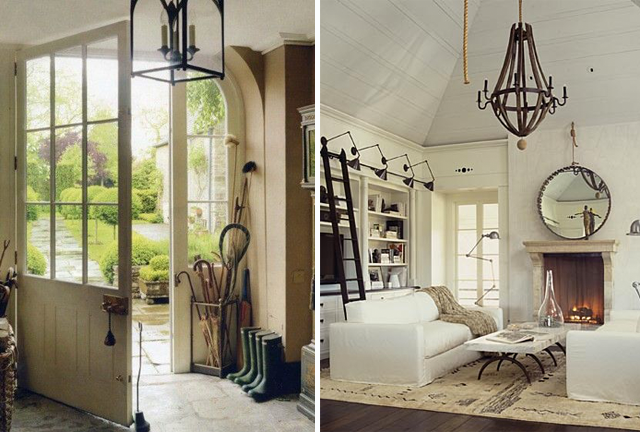 If the ceilings are vaulted, it will further add to a sense of effortless interior drama. As far as decor, farmhouses can go anywhere from country-kitchen-with-butter-churns to minimalist to industrial with some unexpected glam thrown in. We like to decorate them a little kitschy with hay bale forks and tractor grilles turned into lamps. 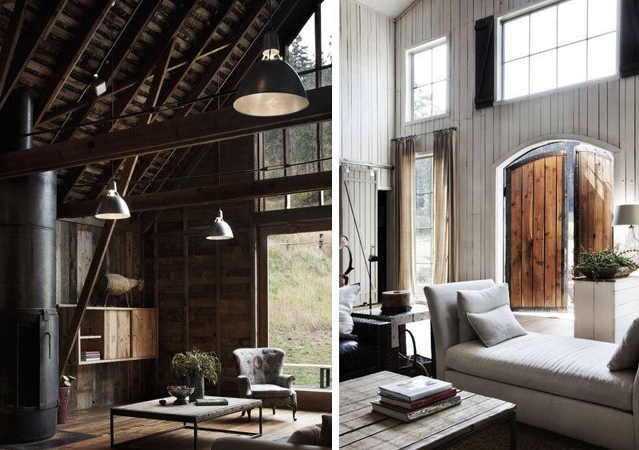 Interior barn doors are common elements, as are wooden farm tables, farmhouse or apron-front sinks, four-poster beds, clawfoot tubs, earthy textiles like woven rugs, and sturdy, casual cotton fabrics. As with anyplace great, the details are important–mason jars, fresh flowers, and galvanized metal fixtures are farmhouse favorites. Ideally, everything will be washed with lots of glorious natural light. 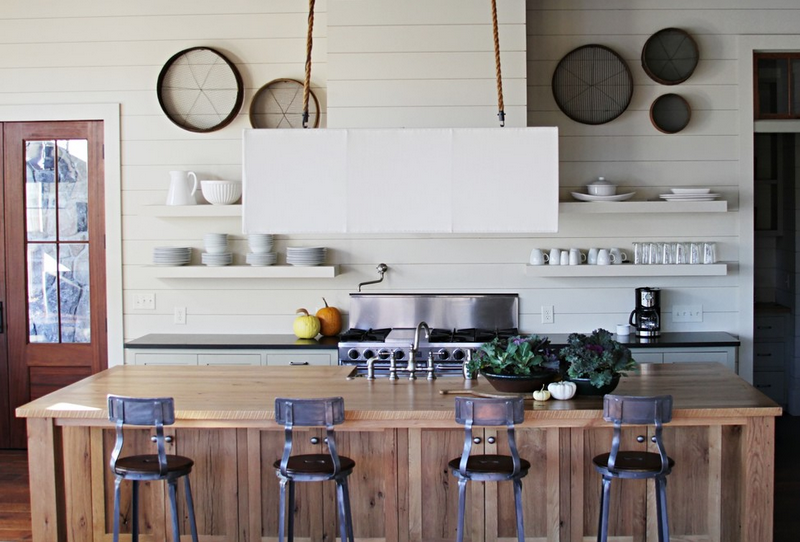 A word about wood: Warm wood tones–or painted white wood–should come into play in every farmhouse. If real wood walls are affordable to you, that’s preferred, even if you just do one wood wall–flanking a fireplace, for instance, or going up a staircase. On our spec homes we unfortunately don’t do anything with reclaimed wood because it’s so expensive. Instead we use lesser expensive materials and then finish them in a way that makes them look like they’re old reclaimed wood. The farmhouse of my dreams would make generous use of shiplap paneling. Do you dream of a farmhouse? 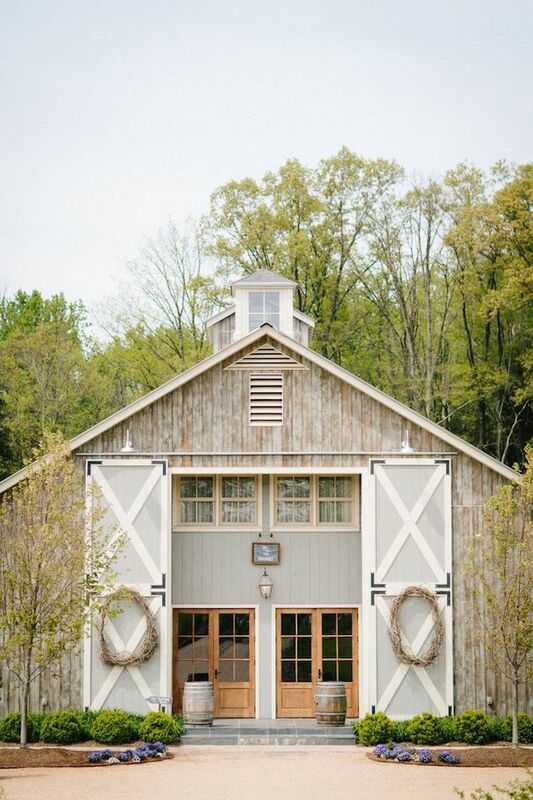 For more farmhouse inspiration, follow my Farmhouses board on Pinterest. This entry was posted in Tips and Tricks and tagged elements of farmhouse style, farmhouse, farmhouse style, farmhouses, how to get farmhouse style on July 23, 2014 by Ellen Barnes. 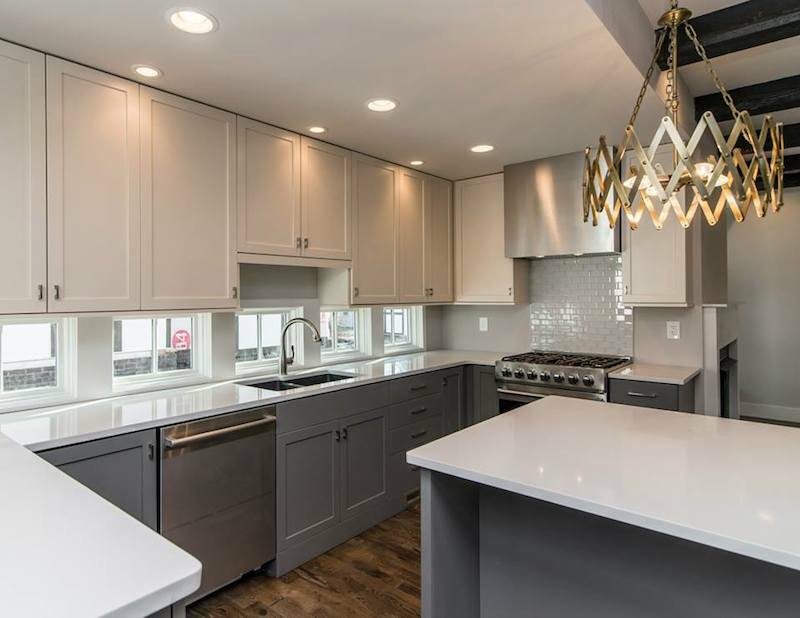 *The majority of these photos are from homes done by Bynum Residential Design in Nashville, but when that’s not the case the photo links to the original source. 1) Slate tile backsplash. In this kitchen, we’ve taken 12X12 slate tiles, cut them into thirds, and installed them in a random pattern. 2) A chalkboard backsplash. 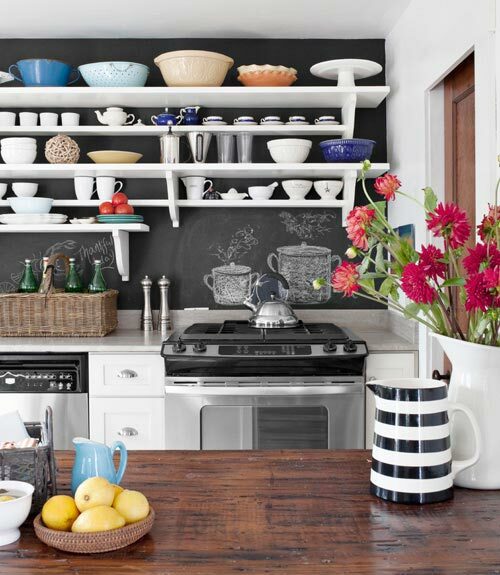 We love the idea of putting chalkboard paint to use as a backsplash. 3) A beadboard backsplash. Beadboard works great, especially in a cottage-style home. 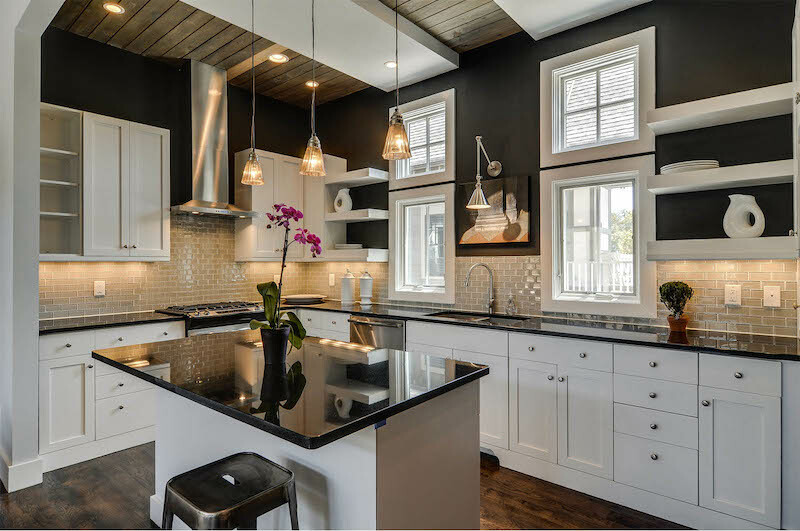 If you have glass cabinet doors up top, consider extending the beadboard from the backsplash up through the back of the cabinets. 4) Backsplash of windows. Pictured here is the backsplash that we did that was all windows in the 925B Kirkwood house; it was a huge hit. 5) Glass tile backsplash. As a slightly glitzier alternative to ceramic subway tiles, I like to use glass subway tiles. 6) Backsplash of different size tiles. 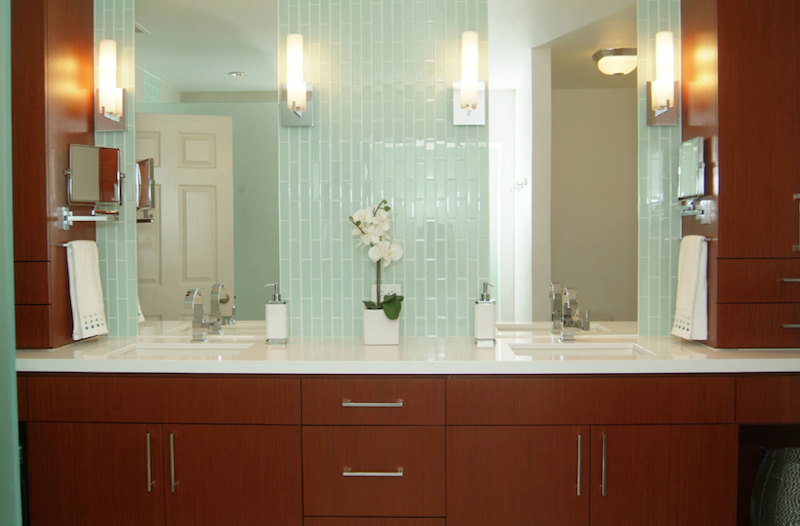 I often like to use glass tiles in different sizes–sometimes in a single color, sometimes using a variety of colors. We’ve had good luck using sheets of pre-cut tile for some of our backsplash installations. 7) Multi-material backsplash. Another favorite idea: use multi-material tiles with marble and metal and glass, all combined in a mosaic. 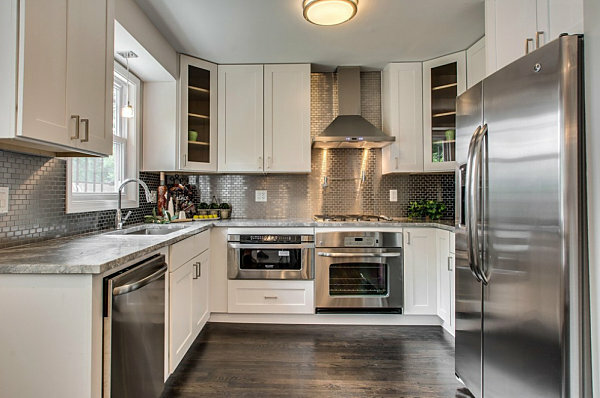 8) Stainless steel tile backsplash. We’ve also used metal tiles—subway shaped—in a kitchen, and it instantly ups the glamour–kind of like slathering the walls in shards of mirrorball. These tiles are especially beautiful with candlelight reflecting off of them. 9) A tongue and groove backsplash. Tongue and groove (or shiplap) is great in a lake house, beach house, or any space where you want a more casual, country, or coastal vibe. 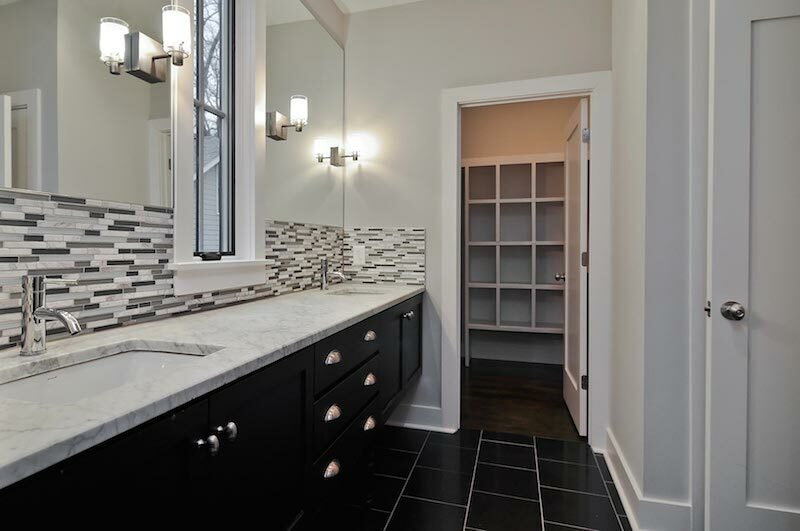 10) A mirror backsplash. 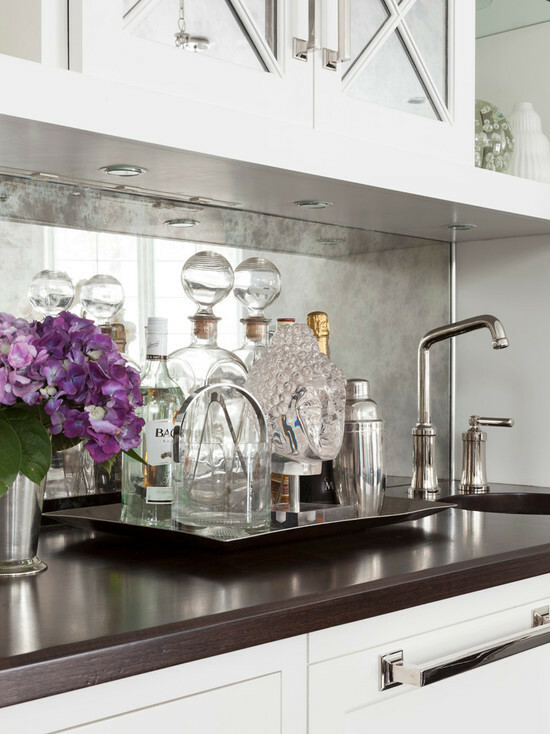 A great way to add light and polish to a bar or kitchen. Antiqued mirror backsplashes are best. 11) A stacked backsplash. Sometimes we install the tiles stacked for a more modern look. 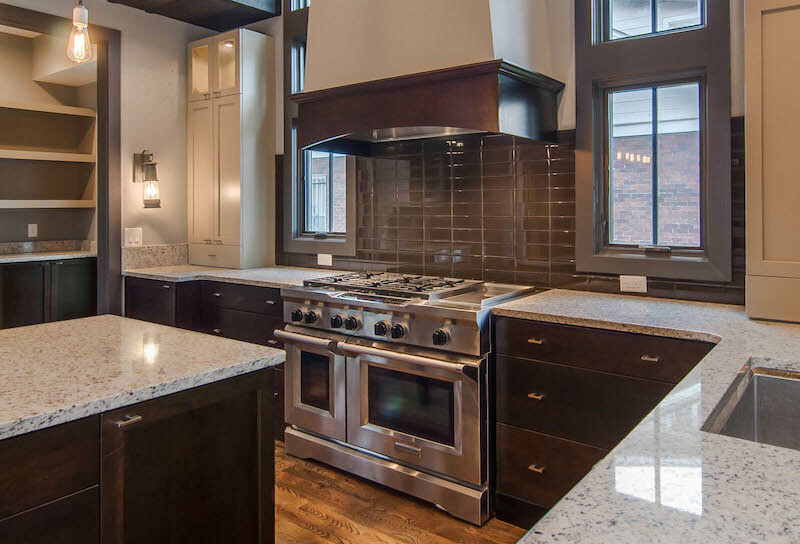 The 12South house we did on Lawrence Avenue is big format glass, which I think works great in a spacious kitchen. 12) A vertical backsplash. Consider installing brick-shaped tile vertically instead of horizontally; this would be best in a bathroom backsplash. 13) A mixed materials backsplash. 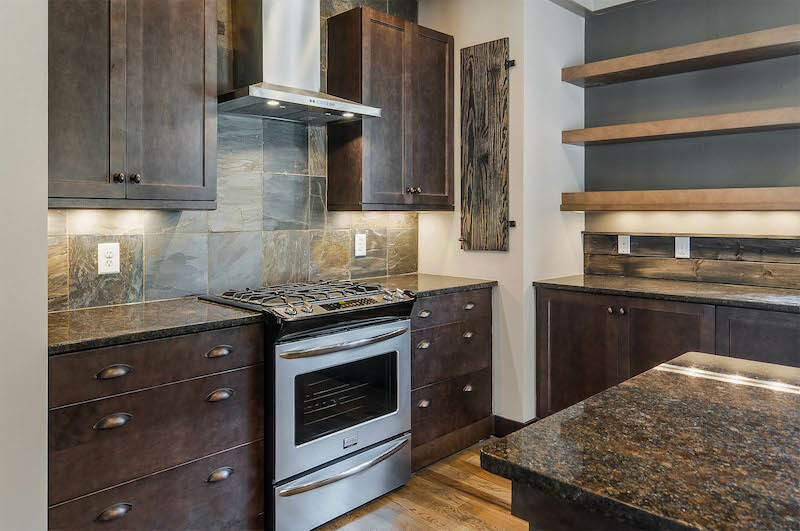 Don’t necessarily feel like you have to choose only one backsplash material. In the kitchen below we used stone tile squares, wood, and hexagon penny tile to create an eclectic backsplash. What’s your favorite backsplash look? 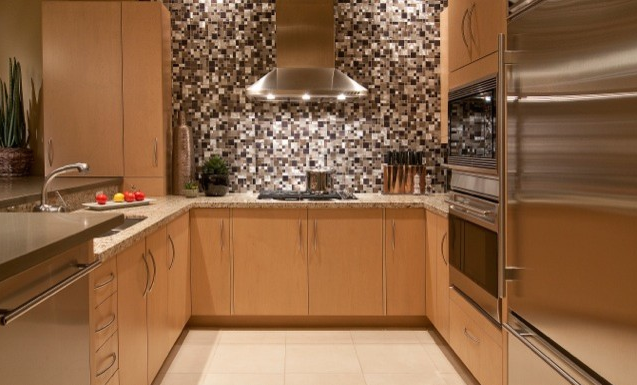 This entry was posted in Tips and Tricks and tagged backsplash ideas, backsplashes on July 16, 2014 by Ellen Barnes.